Approximately fifty visitors were on hand for the Oquawka Village Board meeting Monday night, May 6, 2016. The visitors were on hand for many reasons; one of the most significant being an open forum over the most recent flooding. Resident Ronald "Red" Tee was on the agenda for his complaint about the flood and began the discussion. "I want an answer. I want an answer to what happened when it flooded. Why the stupidity?," he asked. Newly elected Mayor Sandra Moody responded, "We do want to form a flood committee and we want to maintain the levee." Tee questioned, "Why wasn't the siren blown?" He added that the siren had always been blown when the flood waters came over the levee. Board member Troy Jern tried to explain that the Corps of Engineers had said the water had crested in the Quad Cities and when it should have in Oquawka. The river came up much quicker than anticipated. Tee was joined by resident Bob Lafferty (who was on the agenda to speak), who noted, "The levee has been neglected for years." Resident Ronald Bigger noted that the levee did not belong to the village since the flood of 1993. Many in the crowd began raising their voices at this point, telling Bigger to "shut up." Tee and Lafferty became louder, as well. The crowd quickly settled down and Tee and Lafferty apologized for their outburst. Newly elected board member John Fedler remarked, "We need to make sure what the law says about maintaining the levee." One resident asked, "How much is this clean up costing compared to what it would have cost to maintain the levee?" Resident Ben Macintosh explained that those affected by the flood do not want money. "Let's take care of this and make sure it doesn't happen again," Lafferty said. Village President Moody reiterated, "We need a committee and a meeting to begin this." The board will meet with concerned residents on May 14 at 7 p.m. at the Village Hall for a Flood Committee Meeting. Henry Gratt, who has taken over for the late Keith Henry, Water and Street Superintendent, received a round of applause in gratitude of what he has done since Keith passed away suddenly since last month's meeting. Police Chief Brad Mowen gave his monthly report, noting 75 calls for service and 15 arrests for the month of April. He also noted the village had received a grant from Great River Medical Center, allowing monies for some new equipment. Chief Mowen further noted he had prepared a golf cart inspection form. Village Attorney Mike Neff told board members and visitors that two streets had been designated for golf cart driving, Clay and Pike Streets. He said that he did not expect people who did not live on Clay or Pike Streets to "truck in" their golf carts if they wanted to use them. "If you restrict us," Bill Moody stated, "why would we want to go up and down Clay and Pike Streets." Attorney Neff went on to explain the importance of setting this program up right, with studies, and enforcing the law after the ordinances were in place. He suggested the board needs to set up the cost of fines, etc. Many golf cart enthusiasts were present and asked why it would take so long before they could legally drive on Oquawka Streets. Some suggested just letting them drive the streets now. They noted that their own insurance should cover them if an accident should occur. Attorney Neff assured the crowd that if there were to be an injury to occur to a golf cart driver or an innocent bystander, that attorneys would attempt to find fault with the village unless the proper procedures were followed. "A study needs to happen first," Neff said. "and be filed with the city." This study would include a survey of each road proposed to be used by golf carters. This study would ascertain the volume, speed, and character of traffic on each of these roads. The board took the following action: there will be sign up sheets made available to volunteers who want to survey each street in town (excluding Schuyler Street). There will also be a copy of the state statute for the volunteers to read. The Old Board sat until 7:50 p.m., when they went into Sine Die. Before new business began the New Board was sworn in. 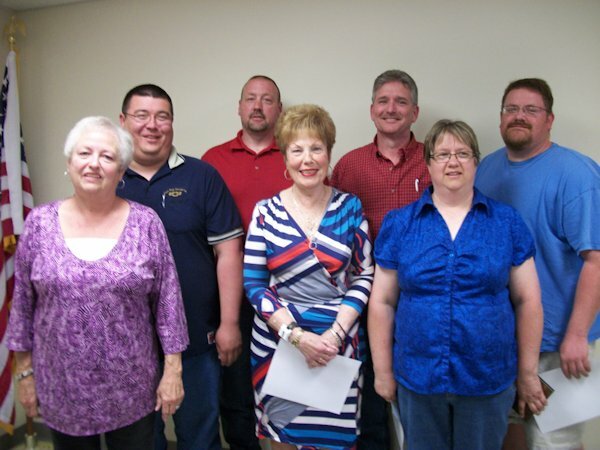 The Old Board consisted of Jason Howard, Troy Jern, Nancy Bundy, Todd Shinberger (absent) and Cindy Henry (absent), as well as the Village President Harold Henshaw. New Board members are: John Fedler, Robert Eldridge, Scott Ray, Nancy Bundy, Troy Jern, Jason Howard, and Village President Sandra Moody. The board reconvened in regular session at 7:55 p.m.
Bruce "Rebel" Ruberg was the first to be heard. His complaint stemmed from a water problem he had had and the board promising him to reseed and smooth out the boulevard in front of his house. "My yard looks like h----," Ruberg exclaimed. Village President Moody asked, "Why did we give you money? I feel you were given money to compensate you for the problem. "It's a crying shame," said Ruberg, "they said they were going to reseed my yard." Village President Moody asked him if he had read the ordinance where it states that beyond the meter, it was the resident's responsibility. Minutes from two previous meetings were read aloud. Board member Bundy was in the midst of reading minutes from a meeting in 2012, which said the board would fix Ruberg's yard, when Ruberg swore at the board and slammed out of the building. In an unrelated matter, Jarid Guyton was on hand to make a request to the board. Guyton is a Life Scout, with Troop 61 Boy Scouts and is working towards his Eagle Scout Rank. He asked for permission to build a community play ground near the village pool. He noted that he is working on grants and fundraisers to pay for the project. The board passed for the approval of the start of the new play ground. Village President Moody addressed the board with a list of actions she would like to perform while she is in office. She said yard sale signs should not be posted on power poles and will be removed. Yard sale signs may be placed in the Village Hall on the bulletin board near the front door. She noted that the "island" at the foot of Schuyler Street needs to be removed so the village can place their floating docks in the river. Notices have been sent to the Oquawka Boat Club concerning this. Attorney Neff will look into it. Moody further added that towboats are not allowed to park close to River Drive while waiting their turns at the lock; this in accordance with ordinance #7-1-4A, Public Ways and Property. Another concern was Village Alleys. Village President Moody believes the alleys should be opened up. This will need some more investigation. She also discussed having a Village Logo. Some board members thought this could be a contest at the school. Village Board President Moody said local residents could find out their house numbers at Village Hall and suggested they be put up. She emphasized how important this is to ambulance and fire crews. A Village Clean-up Day should be planned, Moody suggested. It could be held at the end of May. This would not be a yard sale sort of thing, but rather a bring your hoe, rake, shovel and literally clean up the Village. "I want to make Oquawka a better place to live in and I am willing to help shoulder the load," said Moody. She noted a cook out would be nice to host after the clean up day. She also noted that there should be signs put up for dog owners to clean up after their pets. In closing, Village President Moody said she will be in Village Hall every Wednesday morning beginning at 9 a.m. to listen to residents pertaining to village business. heard from Jared Fluhr with MSA, working on the Schuyler Street Project. He noted there will be a bid opening on May 23 at 1 p.m. at the Village Hall. At the June meeting, it will be announced who was awarded this work. addressed a situation with an abandoned property. Gary Marston, Jr. was on hand to discuss this. His complaint was that the property needs to be condemned. He said the utilities had been removed and there were no windows and barely a door on this property. The board agreed to begin the process. learned of a new IKE grant for $75,000 to be used for a comprehensive plan for future planning. The board will designate who this money will go to at a later meeting. agreed to re-evaluate the burn ordinance at the next meeting. learned of two zoning permits given for the month of April. agreed to pay bills, following a discussion about a bill from Alexis to the Fire Department, for the month of April. They also agreed to accept the April minutes and the March Treasurer's Report in the same motion. passed a proclamation of a disaster in Henderson County - one before the old board and one before the new board.